Difficult to pronounce, but easy to grow, and what a great tree too! Most Acers, or 'Japanese Maples' as they are also known, have amazing autumn leaf colour, but this defies convention by displaying fantastic foliage colour right from spring to late autumn. 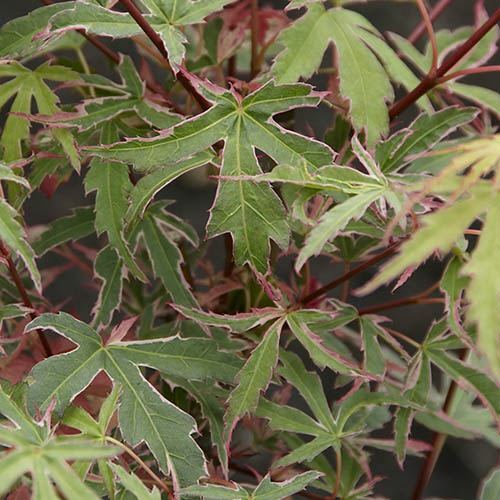 The moment the leaves burst back into life in spring, the striking feature is their deep pink red edges to the cream variegated leaves, which remain all summer before turning orange red in their autumn finale. A superb specimen tree for urban gardens, suits modern and oriental stytles, and looks great in a large pot on any patio or decking, whatever the setting. A great addition - growing it in a large pot means you can take it with you if you move house! A slow growing tree, it will keep for over 10 years in a good pot. Supplied as a 4 year old tree in a 3L pot, 50cm tall, well branched.